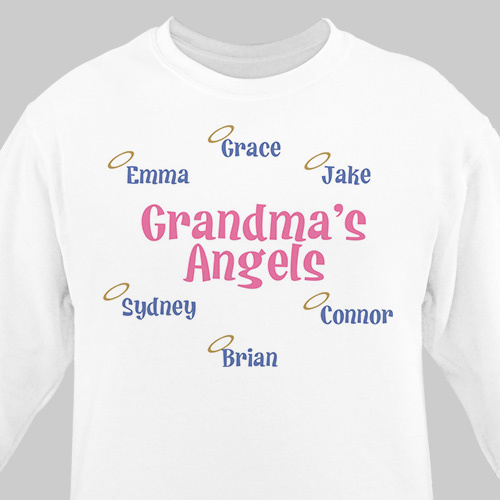 Your Grandchildren are the angels in your life, show them off with our Personalized Grandma Sweatshirts. Grandma, Nana, Gram, Granny, Mom and even Auntie can proudly display all the grandchildren, children or nieces & nephews on an attractive, warm and comfortable sweatshirt! Your new personalized gift is available on our premium white cotton/poly blend sweatshirt, machine washable in adult sizes S-3XL.Includes FREE Personalization. Personalized your Grandma Sweatshirt with up to 30 names & any title. in the title box above. Beautiful sweater. Soft, the print and design was beautiful. It is a great product. Wish could have chose where placement of Angels were on the shirt but came out well. I bought it for my mom. She ABSOLUTELY LOVED IT! GiftsForYouNow.com offers many great Personalized Gifts for Mother’s Day that your Mother or Grandmother will cherish for years to come. We have an extensive collection of Personalized Mother’s Day Frames, Personalized Mother’s Day Shirts & Personalized Keepsakes. Place your favorite Poem onto one of our Personalized Mother’s Day Poetry Gifts or place your favorite Photo onto our wonderful Personalized Photo Gifts. We also have a great selection of Personalized Grandma Gifts, Personalized Sister Gifts & Personalized Friendship Gifts. For all your Personalized Gift giving needs shop at GiftsForYouNow.com today!